Dear Teachers: Do You Teach Joseph Boyden's THREE DAY ROAD? Editors note: Saturday, January 13, 2017. Scroll down to the very bottom of this post to see links to reviews of Boyden's books, written by Native people from the communities a book is about. I know that some of you assign Joseph Boyden's Three Day Road to students in your high school classes. Some of you may be doing author studies of him. This letter and information I share beneath the letter, in two parts, is for you, and for anyone who is interested in discussions of Boyden's identity. It is an archive of items about Joseph Boyden's identity. I'm a former school teacher, too. I particularly enjoyed reading aloud to the kindergarten and first graders I taught in the 90s, and teaching kids about the authors and other books they wrote. I'm not teaching anymore. Now, I research and write articles and book chapters about the ways Native peoples are depicted in children's and young adult books. And, I publish this site, American Indians in Children's Literature, which is now in its eleventh year. In 2014, I learned about a writer named Joseph Boyden. A novel he'd written, The Orenda, was in Canada Reads, which is an annual battle-of-the-books competition. The Orenda was being defended by Wab Kinew. I'd become familiar with Kinew's work via social media. Always on the look-out for books I can recommend, I looked into Boyden and saw that his first book, Three Day Road was in the Canada Reads competition in 2006, when it came out. He was being put forth as a Native writer. I got Three Day Road. I was drawn into the story and thought I might write about it here on AICL. I wanted to know more about Boyden. So, I read Hayden King's review of Orenda. He had concerns with Boyden's depictions of the Haudenosaunee. I started looking around some more and talking with colleagues. I learned that there were a lot of questions about Boyden's claim to Native identity. What I saw was enough for me to set aside Three Day Road. I didn't finish it and didn't write about it. On December 22, 2016, I saw a series of tweets from the IndigenousXca account. That week, the IndigenousXca host was Robert Jago. I learn a lot by following that account. Each week, there's a new host. I was the host in March. Jago's tweets that night were about Joseph Boyden's identity. The next day, Jorge Barrera, a reporter with Aboriginal Peoples Television Network, published a news article about Boyden. Jago and Barrera's work prompted many discussions on social media, and, many more articles and news segments. This "Dear Teachers" letter is a place for me to archive what I've seen about Boyden and identity. Part One of my archive started as a thread on Twitter that I added to whenever I saw something that added to the discussion. Rather than re-create the thread, I'm pasting it directly from a Storify I did. I hope that all the links work, though some may not. People delete tweets, and sometimes their entire account. Beneath the Storify is part two. Part Two is items I'm entering as I see them. It is "in process" -- because new items are published in the media, or on social media (primarily Facebook and Twitter), almost daily. I hope it is useful. If you see something somewhere that you wish to share, please submit it via the comments option at the bottom. 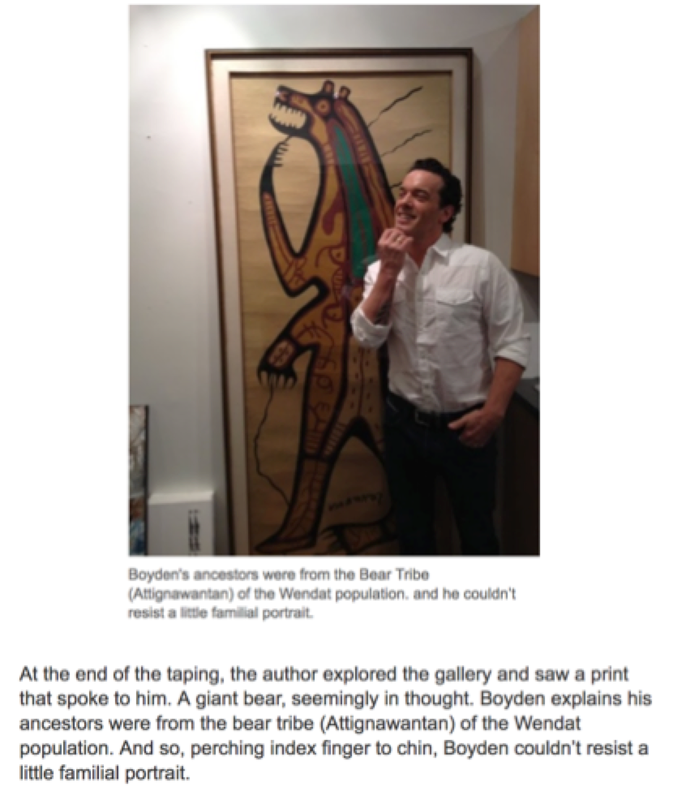 Joseph Boyden: Native? Or not? Did you read @APTN article on Joseph Boyden's identity and are you seeking more rdgs to help you understand Native views on identity? This is, in kid/YA lit, what is called #OwnVoices. It gets very complicated, quickly, for many peoples, including us (Native ppl). Yesterday and today, many Native ppl on Twitter are talking about Boyden and identity. Read their convos but pls refrain from jumping in. My area of research/writing is kid/YA lit. As a former teacher, I know that "author studies" are a much-loved unit in schools. Teachers ask students to read other bks by a specific author, works abt that author's life, etc., to deepen what they know that author/bks. ... Jamake Highwater, who won a Newbery Honor for ANPAO, was a fake. He wasn't Native. So many don't know Forrest Carter is a fake, too. So many libraries have Forrest Carter's EDUCATION OF LITTLE TREE in autobiography section! At the very least, it should be in fiction. Adoption into a Native family is a real thing, but it doesn't mean that Paul Goble can say he's Native. I don't think Joseph Boyden has written for kids or teens. I did find an article from 2007 about a planned bk but can't find it. We need to acknowledge how problematic Boyden invoking an elder as retrospective proof of his indigeneity. The guy asserts he's 1/2 a dozen different kinds of Indian. If you've been adopted, great, but then that's your people. His invocation of an elder, who has passed, reeks of grasping at straws. Which is so despicable. The truth is that Joseph Boyden is the archetype of what white ppl want native ppl to be. He makes white ppl so comfortable. They love him. ...what's a poor bestselling author with a highly variable ancestral genealogy to do? Well one thing is clearer, even Boyden isn't claiming he's Metis anymore. There's consensus on that now. As I noted on Day 1 of my thread on Boyden, Native people-on Twitter & Facebook-have been talking about Boyden's claims to Native identity. People who like Boyden think Native people are jealous, unfair, mean, etc. There's a lot of sympathy for him as an individual. Lot of ppl, in other words, rallying to his defense, embracing him/the story of how he came to identify as Native. Where, though, were those rallying cries for the Choctaw Nation when a Choctaw child was being returned to her Choctaw family? Native ppl following my thread know what I'm talking abt. If you're a Boyden fan following my thread, you may not know what I'm talking abt. Most of you likely read mainstream media that failed in its responsibility to provide you with info abt sovereignty & our status as nations. The Choctaw child has clear lineage. There is no question re her identity or her family. Yet, the public said she was not Indian enough. Native ppl are asking Boyden "who are your people" and "who is your family" but he cannot give clear answers. He has an uncle who played Indian but denied being Indian. Indeed, as the @APTN article showed, that man delighted in fooling ppl. Jago used numbered (rather than threaded) tweets. You'll need to go to that Dec 22nd tweet and read up from there. I urge you do that! ... re Boyden and identity, is wrong. Here's @justicedanielh thread: https://twitter.com/justicedanielh/status/813270135674961920 … Also! Follow Daniel, and read his writings. ... and that Native people don't question his identity. That is not accurate. In Native circles, ppl have had this q for a long time. ... that Native doesn't mean dark hair/skin/high cheekbones. We know it is about citizenship or membership, abt being claimed by a nation. I have given people the benefit of the doubt, and then felt horribly betrayed when truths about their claims were brought out. When I was on faculty at U Illinois, we got burned, twice, by ppl who we hired because we trusted their claim to Native identity. The first was Andrea Smith, who claimed to be Cherokee. She had claimed that identity for years and had cred with key scholars. ... their family, their community, their nation. As adults, Smith, Clark, and Boyden read/studied writings on these takings, these policies. They "know the score" so to speak, on identity and claims to Native identity. They know what it means to make those claims. Boyden said ppl mis-heard him when he said he is Nipmuc. Did he not ask those who misrepresented his identity to correct their error? Way back in this thread, I asked ppl to read, think, and NOT to jump in to defend Boyden. Course, his fans have been jumping in everywhere! ... goes back hundreds of years. For me, it is the Pueblo Revolt of 1680. Catholics/Spanish tried to wipe us/our ways out. We resisted. ... THREE DAY ROAD. It was compelling, but I set it aside. That was when ORENDA came out. I read Native criticism of ORENDA. Recently, I read an interview w Boyden. He was asked abt the criticism. I think he misrepresented the criticism, and thereby, dismissed it. ... Native ppl as violent and barbaric. He fed the white expectation. Native ppl said WTF, Boyden, but he waved them away. ... hosts, but Boyden clearly was not enjoying that interview. If the hosts are always provocative, Boyden shouldn't have agreed to be on! Reporters are tweeting to Boyden, asking him to call them so they can do interviews w him abt this. He's in a hotseat of his own making. I've also seen a lot of tweets from Ernie Cray. Last night, he was interviewed abt Boyden: http://www.ctvnews.ca/video?clipId=1024376&playlistId=1.3218874&binId=1.810401&playlistPageNum=1&binPageNum=1 … He's defending Boyden. ... would Crey feel that way if Boyden was claiming to be Cheam? There's another dimension to the Boyden mess that I haven't included in this thread: Missing and Murdered Indigenous Women and Girls. Boyden, as some know, has a high profile and is often asked to deliver lectures on issues specific to Native people. That article in The Walrus is by its editor in chief, who I think is pretty ignorant. So... major media in Canada is paying attn. I haven't seen anything in US papers. Boyden is on faculty in New Orleans. I wonder if Boyden read Yakabuski's opinion piece in Globe and Mail? http://www.theglobeandmail.com//opinion/joseph-boydens-lynching-should-set-off-alarm-bells/article33444228/?cmpid=rss1&click=sf_globe … If he did, is he nodding? Or cringing? Here's the Bustle article on controversies in young adult lit. https://www.bustle.com/articles/198750-the-worst-book-controversies-of-2016-and-what-to-read-in-response … Three of the 6 are abt Native content. Long thread by @debreese on Native identity. https://twitter.com/debreese/status/812673387415932929 … Upshot: relevant Q not "what's your DNA?" but "what nation claims you?" Joseph Boyden is his uncle Erl: a white person who dresses up like he's a Native person, and performs for White people. Erl put on a headdress and stood by a tipi. Joseph Boyden puts on words. Performing Indians. Basking in adulation. And yes, doing harm. Boyden is far from the first--or last--person to go into a Native community, do research, and walk away and publish things w/o permission. ... a Native org. They--and their pals--think that makes them look good, like they're generous. Reality: that's grotesque exploitation. When I point that out, friends of those white people flock to my blog and defend those writers. Those writers get spun as the victim. ... there, consoling each other and doing the same old thing year after year. Do make sure you read Lenny Carpenter's post on Boyden. https://lennyshish.wordpress.com/2016/12/30/boyden-i-discovered-a-gold-mine-on-james-bay/ … Boyden saying he discovered a gold mine... WTF. ... that love-of-Boyden. That love is in the way, causing hurt and pain, perpetuating ignorance, exploitation. Tabobondung: Those who speak abt Native issues must be people who are grounded in that area/community. Without that grounding, she says, interpretations of that ppl's history can have negative consequences that perpetuate negative stereotypes. Ryan McMahon, on The National panel, "Taking on an identity: The Joseph Boyden debate"
Cheryl Toney Holley's Award Winning Canadian Author Claims that Dartmouth Indians are Really Nipmuck? ... back to the bulleted list, which--from here--is primarily responses to Boyden's remarks. When this started back in December, the headline on the APTN article had "shape shifting identity" in it. As some of these responses indicate, he's shifting his stories now. Previously, he said his family never talked about their Native ancestry, now--he says--they talked about it all his life, from his birth, even, telling stories. 1) Boyden's publisher (Penguin Random House in Canada), and his editor (Nicole Winstanley) voiced support for Boyden. Major publishers like Penguin are huge corporations. Integrity of writing or author does not matter. If it did, Simon and Schuster would not be publishing the White supremacist, Milo Yiannopoulos. It will make a lot of money for its publisher. Boyden's books make a lot of money for Penguin. 2) The Tozer's, who Boyden referenced in his 1/12/17 interview with Candy Palmater, also issued a statement of support. William and Pamela Tozer are Moose Cree, and run Camp Onakawana, near Moosonee, Ontario. In 2014 (article linked below), Boyden wrote about the camp and said that William Tozer is the inspiration for Uncle Will Bird, a character in Boyden's Through Blue Spruce. Pamela Tozer's post on Facebook, We are the Tozer family. Jorge Barrera's interview of Ryan McMahon on Nation to Nation: Boyden, Fonda and Labrador Land Defenders (video broadcast on Jan 12).